The following is Gurudwara Guru Nanak Darbar's official perspective on the recent controversy, as submitted by the gurdwara's secretary, Gurinder Singh Saini, in a letter to The Sikh Times. Despite several requests, however, the gurdwara failed to provide The Sikh Times with a copy of its constitution. Although Saini claimed (September 25, 2005), "Our by-laws are public, they are pinned on the noticeboard of the gurdwara," a regular visitor to the gurdwara told The Sikh Times (September 26, 2005), "I don't think they will [give] a copy to anyone, if somebody presses too much, then they might display one copy in the gurdwara premises." Regarding Paramjit Singh, Saini stated that he is not a formal (paid) member of the gurdwara. He wrote, "We don't keep records of visitors - regular or otherwise, so I cannot comment on whether he was a regular visitor" (September 23, 2005). I refer to the report dated July 18, 2005. The report contains factual errors, which I write to correct on behalf of the gurdwara's management committee. The gurdwara came into existence in 1997. Its by-laws and articles were drawn up by the board of directors in the same year. The current management committee was elected according to these by-laws and is bound by them. Every action by the management committee is always in accordance with these by-laws, while keeping the interests of the sangat [community] and gur-maryada [code of conduct] paramount. Darshan Singh and Raginder Singh were removed by unanimous vote of the board of directors on May 5, 2005 in accordance with the provisions of the by-laws. They have refused to accept the decision of the board and have instead pledged to take over the gurdwara by force. Such a decision on their part has resulted in a group of people adopting illegal and immoral actions. Disrupting the Sunday diwans [congregations], grabbing microphones, making speeches, issuing threats, making obscene calls to the homes of committee members, using vulgarities, and causing damage to the cars of committee members. Attempts to reason with the group through discussion and meetings have failed to produce any positive results. Lately, the group has resorted to open demonstrations, destruction of effigies of committee members, preventing the sangat from entering the gurdwara, and poison-pen letter campaigns. The report claims, "there were not enough votes to remove him [Darshan Singh] at the directors' meeting, so the committee changed the by-laws to remove him from his post." However, the vote to remove both people was unanimous and no provision of the by-laws was amended to facilitate their removal. The report makes various allegations against the committee attributed to Darshan Singh and his group. 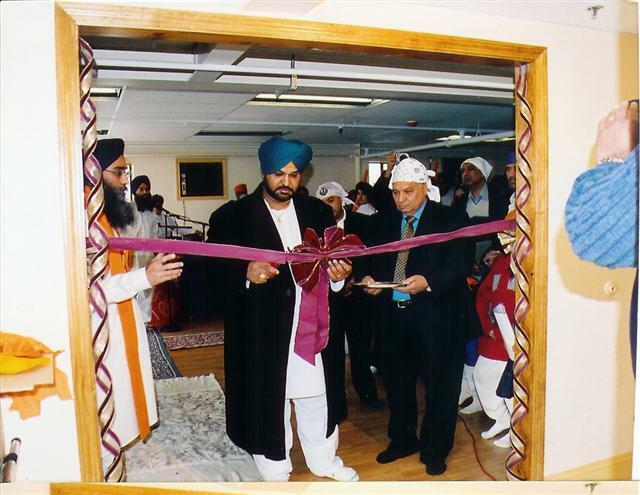 Darshan Singh had been a member of the gurdwara committee since 1997. However, his criticisms of the management committee only appeared after he was removed. These allegations have been made in bad faith to instigate the sangat. The report says that both sides have engaged lawyers. The gurdwara has had a lawyer ever since it was set up in 1997. It is Darshan Singh's group that has engaged a lawyer in order to intimidate the committee. The committee is prepared to go to court as it is convinced that its actions are within the confines of the law. The report claims that "150" people singed a petition for the reinstatement of the sacked duo. It is the committee's estimate that some 20 people signed the petition. Some signatures belong to non-existent people, some people have signed repeatedly, and some have told the committee that they were told the petition was for other purposes. The list has many forged signatures as well. The report quotes one Paramjit Singh as a "member" of the gurdwara. No such person by this name exists in the gurdwara's membership records. Finally, the committee views this conflict as an illegal attempt by a group of non-members and outsiders to take over the gurdwara by force. Such action will not be tolerated. The by-laws provide for elections and change of office bearers. The committee can be changed by legal and peaceful means. In the meantime, the committee will use all legal means to prevent this group from disrupting, inconveniencing and preventing the regular sangat from having its prayers every Sunday.